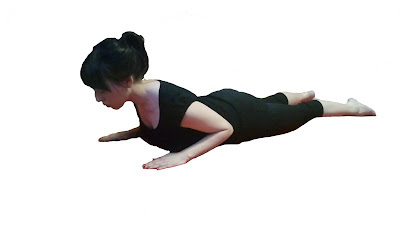 This exercise is intended to help find segmental spine movement in extension. To do this exercise you will need a mat. Start by lying on your belly with your legs lengthened long beneath you and your hands placed flat on the ground by your shoulders. Inhale as you prepare and then exhale as you slid your shoulder blades down your back and reach your elbows towards your back pockets. Inhale as you reach your head away from the tail and begin peeling your head, neck, and shoulders away from the floor. Exhales as you lower your spine to the ground and then inhale as you repeat. Repeat 6-8 times. This exercise is as much about lengthening the spine as it is about lifting it. Be sure that before you lift your head, neck and shoulders that you are reaching your head as far away from your tail as you can. Imagine stretching a marshmallow between each vertebra.